This is an original design from my Graphic illustrations. Easter card design printed on a high quality archival inkjet printer on top quality off white linen texture card stock and off white color linen textured envelope. Greeting card size is approx. 7 1/4" X 5 1/4". 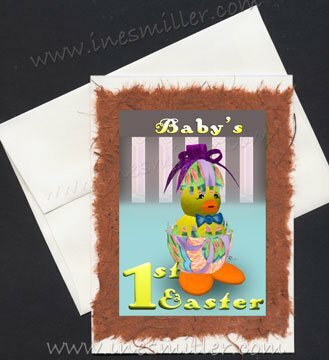 Greeting Card reads : "Baby's First Easter"
Inside handmade greeting card is left blank for your special message. Every greeting card is individually crafted with care, greeting cards are sold individually in a protected clear polycrylic bag. Archival fine quality photo paper print is mounted on linen textured stock paper enhanced with handmade rust colored banana fiber paper . Art print is suitable for framing printed on high quality jet printer with archival inks. Card can be use as complement your Easter gift, Easter Birthday day, Easter party theme cards, invitations, get well cards, love or friendship notes.